August 23, 2013, 12:51 pm -- /EPR NETWORK/ -- With the clear goal of protecting their customers against the negative effects of poor customer care, ShoreTel Unified Communications and IP integrators have been calling on SJS Solutions to provide wallboards and digital signage solutions that drive improvements in agent behaviour, customer care and profitability. Digital signage and contact center wallboard experts’ SJS Solutions continue to attract customers and resellers throughout North America. SJS are the sole developers of Optymyse4™, an enterprise wallboard product that offers unparalleled levels of screen design flexibility and Optymyse Instant™ an entry level wallboard product designed for smaller call and contact centers. In the last 3 months the SJS reseller network has been strengthen with the inclusion of IP integrators: Xtelesis in California, Converged Technology Professionals who cover Wisconsin and Illinois, Optinet Systems of Canada and IPC Technologies, based in Virginia. All of these companies have been helping their ShoreTel customers improve customer care and agent communication through the installation of SJS Solutions, contact center wallboard technology. The influx of interest from North America grew from the attendance by SJS at ShoreTel’s Technology Partner Conference in Orlando 2012, where SJS were able to show resellers and customers exactly how their wallboard solutions were special. With installations in the UK, Europe, North America, Asia and Australia SJS already have a global presence and anticipate further worldwide growth as their reseller program moves into the second half of the year. SJS continue to improve their digital signage and wallboard technology and are constantly looking for ways to deliver more for less. Right now SJS are able to offer a raft of features using very small compact hardware. Their most complex and feature rich solution Optymyse4™ is able to deliver live news, multi-media, animation and endless branding possibilities via a tiny PC that weighs less than 2.2Lbs (1kg). To see Optymyse4™ in action visit the SJS Solutions YouTube Page and website SJS Solutions. Founded in 2001 SJS Solutions is a provider of Contact Center Optimization Software and Solutions, designed to improve customer care within call and contact centers of all sizes. 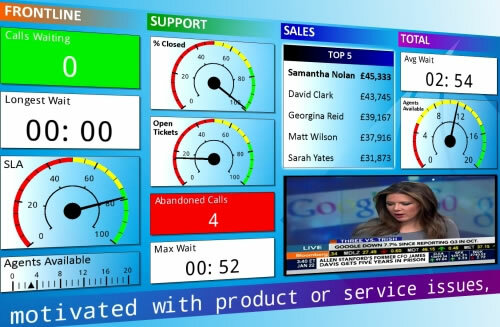 Our range of products includes highly flexible, dynamic, multi-media digital signage solutions, graphical ACD reporting and entry level wallboard solutions. SJS products are installed in a wide range of vertical markets including local authorities, express transportation, healthcare and finance. Our clients are worldwide and range in size from large multi nationals to SME.